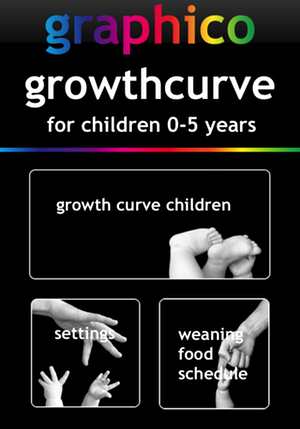 Graphico BabyGrowthcurve App for children aged 0 - 5 year now available in Appstore! 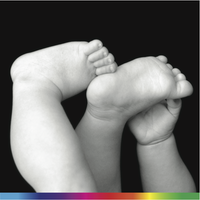 Use Graphico to monitor your child's weight gain, linear growth and change in head circumference during the first five years of his/her life. Inform yourself about healthy nutrition for your baby. Choose your own language: English, French, Dutch or German. 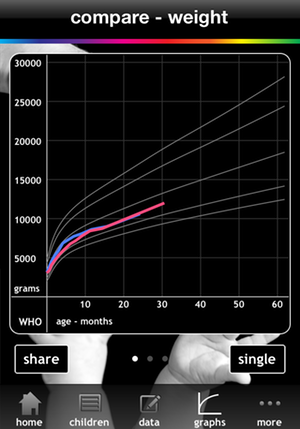 Graphico BabyGrowthcurve App uses WHO & CDC growth references and is beautifully designed. 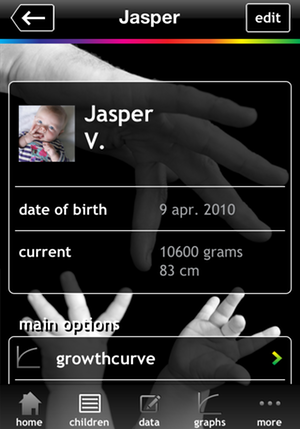 Graphico BabyGrowthcurve App for iPhone and iPad is developed by Kleintjesconsult. 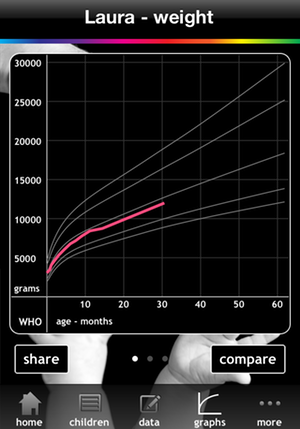 Create a graph of your child's weight gain, linear growth and change in head circumference. Create multiple charts for multiple children. 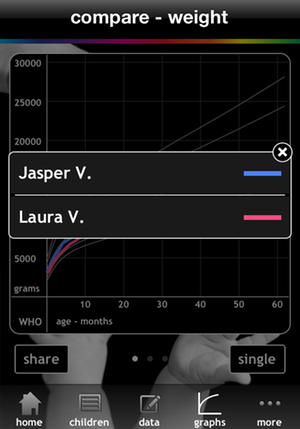 Swipe to check weight, length and head circumference graphs. Compare growth and development of several children in one graph! Use of Growth References of the World Health Organization (WHO) or of the Centre for Disease Control (CDC) in the USA, two leading international standards. 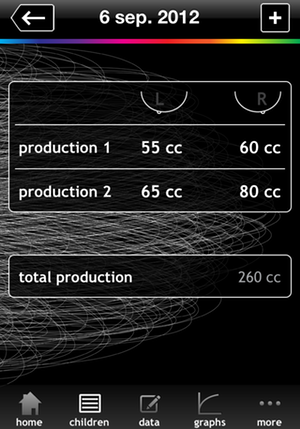 Switch easily between WHO and CDC curves. Use metric or imperial units. Choose from thirteen different backgrounds. Calculate the expected length of your child at age 18. Make notes of the progress of your children. Use Dutch, English, French or German. 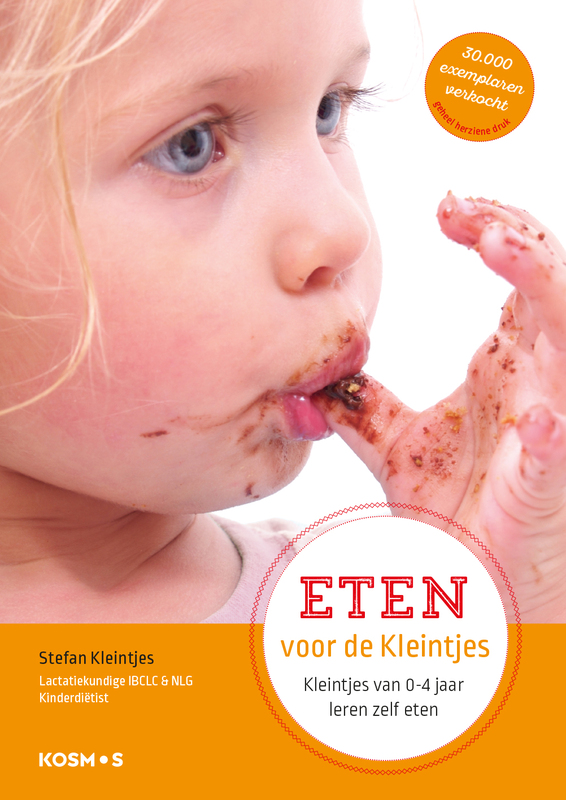 Well-known food introduction schedule for children from six months to four years which shows you what's healthy food for your child available. With convenient search! 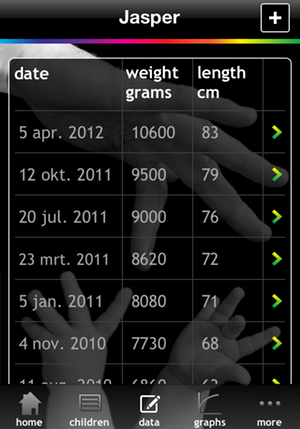 Proudly share your child's growth charts on Twitter and Facebook. 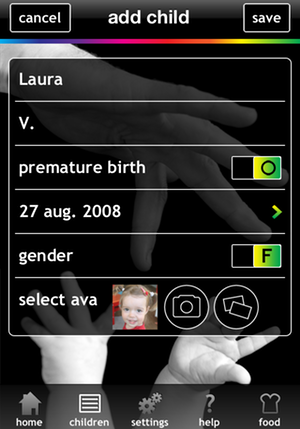 Easily inform your partner, friends and family on the latest growth data for your baby. Keep track of the amount of milk you expressed. Set an alarm for pumping milk. Make a collection of baby pictures so you can always see your child when pumping milk. Want to know more about WHO en CDC growth references? The World Health Organization (WHO) growth standards are a simple tool to assess whether children are growing and developing as they should. These standards demonstrate that children born in different regions of the world, when given the optimum start in life with breastfeeding, have the potential to grow and develop within the same range of height and weight for their age. The WHO standards are widely used in public health and medicine and by governmental and health organizations for monitoring the well-being of children. The standards can also be used to screen for children not growing to their full capacity or those who are overweight. These standard establishes breastfeeding as the biological norm and the breastfed infant as the standard for growth and development. The Centre for Disease Control in the United States (CDC) growth charts consist of a series of percentile curves that illustrate the actual growth in children. Growth charts are not intended to be used as a sole diagnostic instrument. Instead, growth charts are tools that contribute to forming an overall clinical impression for the child being measured. 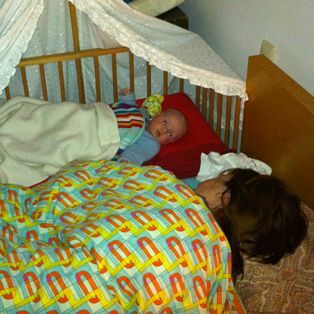 The CDC recommends to use in the US the WHO growth standards to monitor growth for infants and children from birth tot two years of age and the CDC growth charts for children aged two years and over. Want to write about Graphico BabyGrowthcurve App? 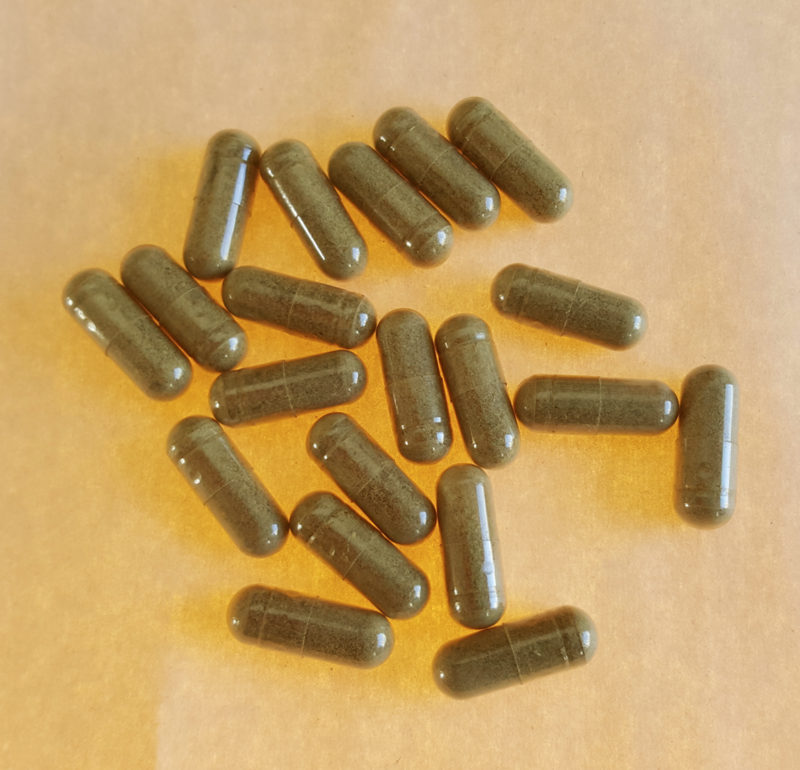 Ask for a promo code! Mail to Promo code. Please tell us where the review will be published. 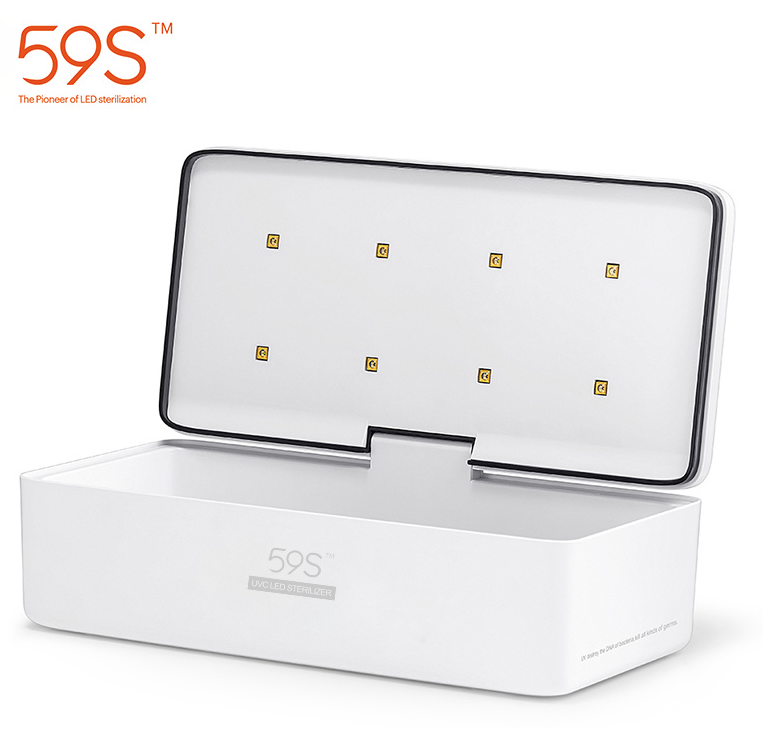 Compatible with: iPhone 3GS, iPhone 4, iPhone 4S, iPod touch (3rd generation), iPod. touch (4th generation) and iPad. Requires iOS 4.3 or later.